Varadvinayak Ganpati Bhakta Niwas: Bhakta Niwas (Tel: 02192-266912 and Tariff: Rs 200) is the ideal place to stay here. The rooms and loos are clean and well-maintained. Lunch is provided as prasad by the temple (noon-2 pm). Else, villagers (temple officials guide visitors to them) provide good meals for Rs 40 per thali. The Varadvinayak Mahad Ganpati Temple/Mandir is the Seventh Ganesha temple among Ashtavinayak to be visited during the Ashtavinayak Darshan yatra/tour. The idol at the VaradVinayak Mahad Ganpati Temple is Swyambhu murti and the temple is actually recognised as a Math.The temple is very simply designed with a tiled roof, a dome 25 feet high with golden pinnacle and a golden summit (Kalas) which has a carving of a cobra (also a deity revered by Hindus). The Temple is 8 feet long and 8 feet broad. The original idol of Varadvinayak can be seen outside the sanctum. Since the idol was in a badly weathered condition, the temple trustees immersed that idol and consecrated a new idol in that place. However, such a decision of trustees was objected by few people and a suit was filed in the district court. Result of this case is still awaited. Now two idols, one inside the sanctum and one outside the sanctum can be seen. The sanctum made up of stone and surrounded by beautifully carved stone elephant carvings, houses the idol. Lord Ganesha is said to reside here in the form of varada Vinayaka, the giver of bounty and success. This Ashta Vinayak shrine faces east (Purvabhimukh) and is enshrined in the sitting posture, with his trunk turned towards the left. The stone idols of Riddhi and Siddhi are seen in the sanctum. Lord Ganesha as Varad Vinayak fulfills all desires and grants all boons. A Gomukh is seen on the north side of the temple from which flows the holy water. A holy pond is situated on the west side of the temple. This temple also has the idol of Mushika, Navagraha Devtas and Shivalinga.In the month of Bhadrapad shuddh (the waxing period) from first day to panchami and in the month of Magh shuddh till panchami, major festivals are celebrated in this temple. Bhakta Niwas (Tel: 02192-266912 and Tariff: Rs 200) is the ideal place to stay here. The rooms and loos are clean and well-maintained. Lunch is provided as prasad by the temple (noon-2 pm). Else, villagers (temple officials guide visitors to them) provide good meals for Rs 40 per thali. It is located in Mahad samll town situated in Khalapur taluka near Karjat and Khopoli of Raigad District, Maharastra, India. In the month of Bhadrapad shuddh from first day to panchami and in the month of Magh shuddh till panchami, major festivals are celebrated in this temple. Shree Dhondu Paudkar in 1690 A.D. found the swayambhu idol of Shree Varadvinayak in a lake. This idol was kept in a nearly goddess temple for some time. The famed Varad Vinayak temple was built in 1725 by peshava sardar Ramji Mahadev Biwalkar and he gifted this to the village. The structure of the temple looks like an ordinary house. The mysterious idol of lord Ganesh was found under the well behind temple, and this is the main center of attraction. There is a Gomukh towards nort, a visage of a cow from which flows the tirth holy water. A unique feature of Mahad Varadvinayak Temple is a lamp (Nandadeep) that is glowing continually since 1892 (107 years). Legend has it that the childless king, Bhima of Koudinyapur and his wife met the sage Vishwamitra while they had come to forest for penance. Vishwamitra gave the king a mantra (incantataion) Ekashar Gajana Mantra to chant and thus his son and heir, prince Rukmaganda was born. Rukmaganda grew up into a beautiful young prince. One day, on a hunting trip Rukmaganda stopped at the hermitage of Rishi Vachaknavi. The Rishi's wife, Mukunda, fell in love at the sight of the handsome prince and asked him to fulfill her desires. The virtuous prince flatly refused and left the ashram. Mukunda became very lovesick. Knowing her plight, King Indra took the form of Rukmaganda and made love to her. Mukunda became pregnant and gave birth to a son Gritsamada. In time, when Gritsamada learned of the circumstances of his birth, he cursed his mother to become the unattractive, thorny berry-bearing "Bhor" plant. Mukunda in turn cursed Gritsamada that a cruel rakshas (demon) will be born from him. Suddenly they both heard a heavenly voice saying, "Gritsamada is the son of Indra", leaving them both shocked, but too late to alter their respective curses. Mukunda was transformed into the Bhor plant. Gritsamada, ashamed and penitent, retreated to the Pushpak forest where he prayed for a reprieve to Lord Ganesh (Ganapati). Lord Ganesha was pleased by Gritsamada's penance and offered him a boon that he will bear a son who would not be defeated by anybody other than Shankara (Shiva). Gritsamada asks Ganesh to bless the forest, so that any devotees who pray here will be successful, and also urged Ganesha to stay there permanently and asked for knowledge of Brahma. Gritsamada built a temple there and the Ganesha idol installed there is called Varadavinayaka. Today the forest is known as Bhadraka. This temple is now believed to be the temple at Mahad. Gritsamav is known as the creator of the Ganana Twam mantra.It is said that if the coconut received as prasad during Maghi Chaturthi is consumed, one will be blessed with a son. Hence the temple is especially full with devotees during Maghi Utsav. 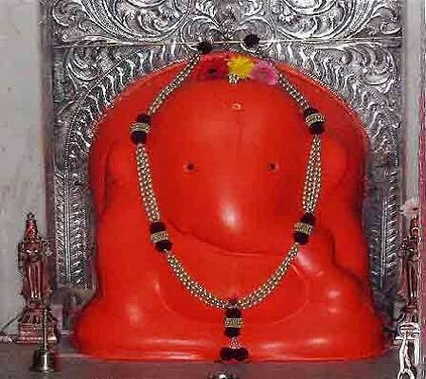 Mahad Varadvinayak Ganpati Temple By Road: Mahad Varadvinayak Ganpati Temple at Mahad is 63 km from Mumbai, 85 km from pune, 25 km from Karjat, 21 km from lonavala and 6 km from Khopoli. The temple is 1.5 kms off the Mumbai – Pune old Highway. Mahad Bus Station, operated by Maharashtra State Road Transport Corporation (MSRTC), connects the place with other major towns such as Khopoli, Mahabaleshwar, Karjat, Alibag, and Shivthar Ghal. Mahad can also be reached via Mumbai – Panvel – Khopoli road. 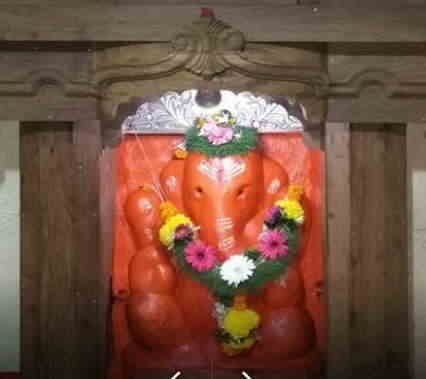 Mahad Varadvinayak Ganpati Temple by Train: Khopoli/Karjat Railway Station on central railway line is the nearest railway station for Mahad Ganpati Temple. All express trains stops at Karjat station. 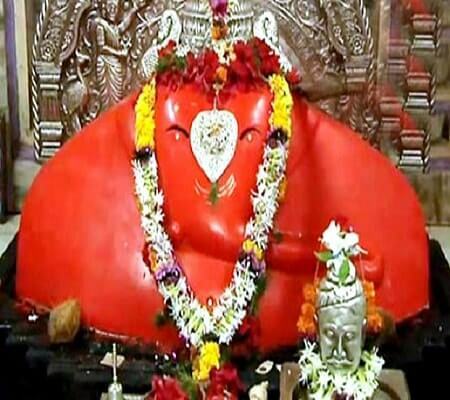 Mahad Varadvinayak Ganpati Temple by Air: Mumbai Airport/Pune Airport is the nearest airbase. Both are on almost equal distance from Mahad Ganpati Temple (75-80 km). Mahad to Lenyadri Distance: 3 hr 52 min (143 km), via Bengaluru - Mumbai Highway/Mumbai - Pune Highway/Mumbai - Pune Expressway and NH60, Fastest route, despite the usual traffic, This route has tolls. Mahad to Ranjangaon Distance: 3 hr 8 min (130 km) via Bengaluru - Mumbai Highway/Mumbai - Pune Highway/Mumbai - Pune Expressway, Fastest route, the usual traffic, This route has tolls. Mahad to Theur Distance: 2 hr 51 min (111 km) via Bengaluru - Mumbai Highway/Mumbai - Pune Highway/Mumbai - Pune Expressway, Fastest route, despite the usual traffic, This route has tolls. Mahad to Siddhatek Distance: 4 hr 18 min (184 km), via Bengaluru - Mumbai Highway/Mumbai - Pune Highway/Mumbai - Pune Expressway and Mumbai Hwy/Pune - Solapur, Road/Solapur Road/Solapur - Pune Highway, Fastest route, the usual traffic, This route has tolls. Mahad to Morgaon Distance: 3 hr 24 min (154 km) via Bengaluru - Mumbai Highway/Mumbai - Pune Highway/Mumbai - Pune Expressway, Fastest route, the usual traffic, This route has tolls. Mahad to Ozar Distance: 3 hr 30 min (132 km) via Bengaluru - Mumbai Highway/Mumbai - Pune Highway/Mumbai - Pune Expressway and NH60, Fastest route, despite the usual traffic, This route has tolls. Mahad to Pali Distance: 1 hr 16 min (37.6 km) via SH92, Fastest route, lighter traffic than usual. 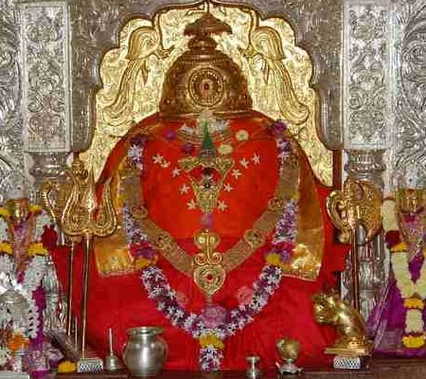 Shri Ballaleshwar Ashtvinayak Temple is one of the eight temples of lord Ganesha in the tour of ashtavinayaka. Among ashtavinayaka Ganesha temples, Ballaleshwar temple is the only incarnation of lord Ganesha that is known by his devotee's name.